Will We Ever have 3D Printers in Every Home? The ability to design and manufacture a physical object using 3D printing was a major technological breakthrough. Today, just a few years since it was first introduced, there’s already talk of how it is reshaping our future. Imagine if 3D printers could be found in every home. What would this mean? So say your dishwasher breaks down and needs just one, single part replaced—wouldn’t it be easier and faster, not to mention significantly cheaper, to print the part at home versus calling the store, figuring out your warranty, ordering the aforementioned part, and waiting for it to arrive? To date, ease of use is still a major issue and the operational issues as well as maintenance required for the upkeep for a 3D printer makes it difficult for average households to justify the cost of buying a machine that costs anywhere from $1,000 to $4,000. 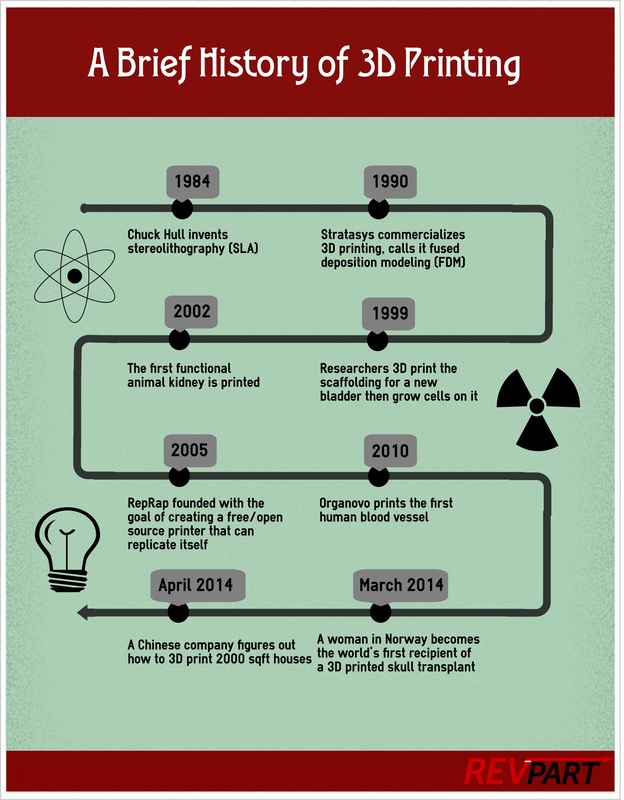 See the Image source and full discussion of the history of 3D printing here. Of course, the prospect of owning a 3D printer in every home is an exciting one, and as the technology continues to advance, 3D printers are able to produce more and more objects of varying materials on demand, including electronics and sensors, glass, ceramic, and even metals. And they are getting cheaper, bringing us closer to having a truly 3D printed world. Ultimately, all of these developments highlight its potential for home application. From something as simple as 3D printing kitchen knives on demand to the potential of using the technology for 3D printed edibles….the latter could see you sending your data to a food-based 3D printer so that it can prepare the optimal meal, or nutritional supplements that you require. But while the potential applications are promising, the fate of 3D printing as a necessary appliance in households is still unclear. Of couse, it would be best to take that with a grain of salt—after all, Ken Olson (founder of Digital Equipment Corporation) once said that “there is no reason anyone would want a computer in their home,” back in 1977. And look at where we are now.